A stir fry is one of my "go to" recipes for a busy night. I can put on a pot of rice and have dinner on the table in around 30 minutes. I had a package of organic chicken tenders in the freezer and had them deforsted in no time. Cut them up in bite sized pieces and tossed with about 2 TBL of dry sherry and 2 TBL soy sauce and set aside. You could also do beef, shrimp or pork. Or no protein at all. Cut up my greens in fairly uniform pieces, with the leaves just sliced in about 1" strips. Cut a medium onion in 8 chunks. Clean and quarter a few mushrooms. You can add nearly any fresh veggie to a stir fry. Chop 2-3 cloves of garlic and about a 1" piece of fresh ginger. I chose a lemony sauce, which I think pairs very well with chicken or shrimp. 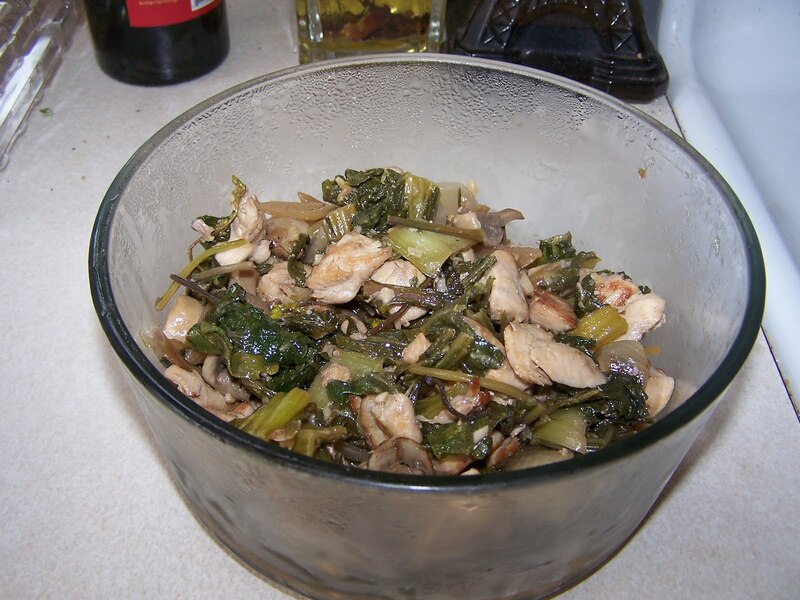 A glaze simply thickens the liquids in the stir fry sauce and pulls everything together. I use about 1TBL of cornstarch mixed with 1/4 cup of water or chicken stock. Drizzle about 1TBL oil in deep fry pan or wok. Let it get wicked hot. Drop in 1/2 of your protein. Don't move it around yet. Let it caramelize on the one side then give it a toss. You WANT those bits of brown....they add flavor! Usually takes 3 min or so. When cooked through, put in a bowl. Repeat with the rest of the protein. Set aside with 1st batch. Drizzle a bit more oil in pan. Maybe 2 TBL. Add the onion first and brown for a couple of minutes. Add the next crunchiest veggie and stir fry for a minute. Lastly add the greens and continue till all the veggies are tender yet still crispy. This does NOT take long, so watch carefully. I then, and only then, add my garlic and ginger. Stir fry an additional 30 seconds...you don't want to burn that garlic! Return protein to pan, add your stir fry sauce (lemon, in this case), and toss around with veggies. Lastly, add your cornstarch glaze mixture and stir to coat. Let cook for another minute or so to lose the raw cornstarch taste. Serve with rice or noodles or all by itself! The above "demo" will be repeated at our CSA farm this Thursday. I'll be set up with a couple of fry pans and all the ingredients (minus the protein) and be demonstrating how easy it is to put together a delicious meal, using the bok choy, chinese cabbage, and scallions from the farm, plus some carrots for a bit of color. Are these instructions simple enough? Let me know if there's something I've missed, eh? I love stir fry. It is one of my fast foods too. Last year I had no idea what to do with the over abundance of Swiss chard we had. Then I discovered stir-frying it. I'm going to try this recipe this week! Sounds so good. Oh wow... I never thought to include pineapple in a stir-fry! That sounds awesome! I must try that... it would be great for summer recipes! I am going to try your sauce! 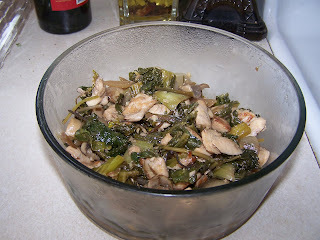 We eat lots of stir fry in the spring and summer...it is one of my favorite "throw together" meals! That's for the tip on adding lemon! We love stirfry and I agree that it is so easy to make. The hardest part is getting everything ready, LOL. DH just got a new wok for his new oven, and he's anxious to season it and then use it! Love your recipes and the variety of things you do. I'd love to come spend a day in the kitchen with you because you just seem so at ease there and do your food preparations with the greatest of ease. That all comes through in the way you present your recipes. Hope all is going well for you guys! Hey- Have you ever made any cheese? I think I would like to give it a try. I have a glut of chard at the moment... Wonder how that would be?